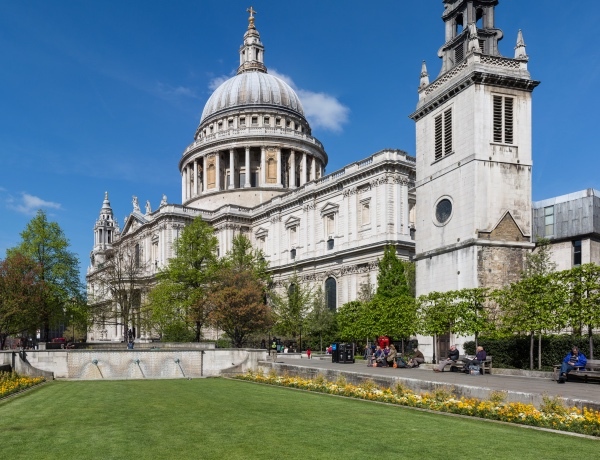 Created as part of the City of London’s contribution to 1951’s Festival of Britain, these gardens are found just to the south-east of St Paul’s Cathedral. One of a series of gardens located around the cathedral, they were created on the former site of the street known as Old Change in an area which had suffered considerable bomb damage in World War II. Laid out by Sir Albert Richardson, the gardens feature a sunken lawn with a wall fountain at the west end which was a gift of the Worshipful Company of Gardeners. 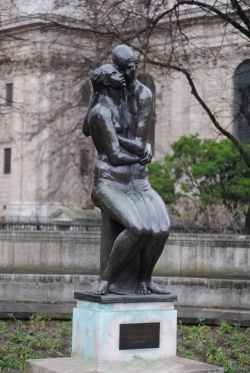 The gardens, which are permanently open to the public, also contain Georg Erlich’s sculpture, The Young Lovers, which was erected on the garden’s upper terrace – above the water fountain at the west end – in 1973. Some relandscaping took part in 2012 including the creation of a new garden to the west, called the Queen’s Diamond Jubilee Gardens. I think about 1951’s Festival of Britain quite a lot. But I didn’t realise that gardens near St Paul’s Cathedral were built for that special event. Nor did I know about the gift of the Worshipful Company of Gardeners. Thank you.